Gareth Bate and Dawne Rudman are curating this 2012 World of Threads Festival exhibition. Canada, Ontario: Alliston: Amy Bagshaw, Jason Legault, Ridgetown: Mark Reinhart, Toronto: Jessica Marion Barr, Sandra Poczobut. For the first time we held an entire fibre art exhibition outside! Our Outdoor Environmental Installations featured site-specific work made especially for the Festival that engaged the grounds of Queen Elizabeth Park Community and Cultural Centre. The raised garden islands around the parking lot and the main entrance to the building were activated with exciting installations. The Common Thread International exhibitions are the flagship shows of the World of Threads Festival. Hundreds of artists from around the world submitted bodies of work, installations or individual pieces to the Festival. Multiple curators from various Oakville and Toronto galleries created exciting exhibitions based on their own unique interests. We bring international contemporary fibre art to Oakville and the Toronto area as well as highlight the strength of our local artists. 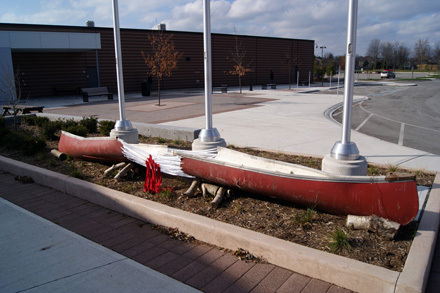 The Outdoor Environmental Installations were in the grounds of Queen Elizabeth Park Community and Cultural Centre, Oakville's newest cultural centre which opened in April 2012. Special Thanks to Gallery Liaison Tonia Di Risio.